The USFWS announced the opening of the Detroit River International Wildlife Refuge in Michigan to migratory bird hunting, upland game hunting and big game hunting for the first time, while expanding hunting activities at 16 national wildlife refuges in 14 states. Notice of the 2012-2013 Refuge-Specific Hunting and Sport Fishing Regulations published in the Federal Register on September 11, 2012. The rule provides additional public hunting opportunities in fulfillment of the National Wildlife Refuge System Improvement Act of 1997. Notice of the proposed rule change was published in the Federal Register on July 11, 2012; public comments were accepted through August 10, 2012. "The National Wildlife Refuge System, one of America's greatest conservation success stories, is committed to offering quality hunting and fishing programs -- for all Americans -- wherever they are compatible with refuge purposes," said Service Director Dan Ashe. The rule will close Hakalau Forest National Wildlife Refuge, HI, to big game hunting. With this change, the refuge will be closed to all hunting activity. The refuge is also closed to sport fishing. The new rule will also close Santee National Wildlife Refuge, SC, to migratory bird hunting. The refuge is open to sport fishing. All but two of the refuges affected by the rule change will remain open to sport fishing. Big Muddy National Fish & Wildlife Refuge, MO, expands area for migratory bird, upland and big game hunting. Block Island National Wildlife Refuge, RI, adds deer to the refuge’s big game hunting program. Bond Swamp National Wildlife Refuge, GA, adds migratory bird hunting and upland game hunting; expands area for big game hunting and addition of wild turkey to big game hunting program. Chickasaw National Wildlife Refuge, TN, expands area for migratory bird hunting, upland game hunting and big game hunting. Deer Flat National Wildlife Refuge, ID, expands area for big game hunting. The refuge is also open to migratory bird and upland game hunting. Saddle Mountain (Hanford Reach) National Wildlife Refuge, WA, expands area for migratory bird hunting, upland game hunting and big game hunting. Adds chukar (a member of the pheasant family) to upland game hunting program. Julia Butler Hanson Refuge for the Columbian White-Tailed Deer, OR, expands area for migratory bird hunting. Lower Hatchie National Wildlife Refuge, TN, expands area for migratory bird hunting, upland game hunting and big game hunting. Minnesota Valley National Wildlife Refuge, MN, expands area for migratory bird hunting, upland game hunting and big game hunting. Ninigret National Wildlife Refuge, RI, adds deer to species for big game hunting program. The refuge is also open to sport fishing. Red Rock Lakes National Wildlife Refuge, MT, expands area for migratory bird hunting and big game hunting. Upper Ouachita National Wildlife Refuge, LA, expands area for migratory bird hunting, upland game hunting and big game hunting. William L. Finley National Wildlife Refuge, OR, expands area for big game hunting. Under the National Wildlife Refuge System Improvement Act of 1997, the Service can permit hunting and fishing along with four other types of wildlife-dependent recreational uses where they are compatible with refuge purpose and mission. Hunting, within specified limits, is permitted on more than 300 national wildlife refuges. Fishing is permitted on more than 270 national wildlife refuges. Other wildlife-dependent recreation on national wildlife refuges includes wildlife observation, photography, interpretation and education. The National Wildlife Refuge System, managed by the Service, is the nation's premier system of public lands and waters set aside to conserve America's fish, wildlife and plants. More than 320 refuges currently permit hunting as a traditional recreational use of renewable natural resources. showing a 10% decline in hunting participation between 1996 and 2006. The 2011 Survey reports a corresponding increase in hunting equipment expenditures, which are up 29 percent from 2006. The Survey is being released in phases – the first report was issued in August 2012 and presented data for the nation as a whole. The final national report will be available in November 2012, and the detailed state reports will be issued on a flow basis beginning in December 2012. The full State Overview Report can be downloaded at http://library.fws.gov/Pubs/natsurvey2011-prelim-state.pdf. Precipitation fell across most of the Great Lakes basin on Friday and Saturday, with the exception of the Lake Superior basin which has been very dry so far this month. Temperatures over the weekend were near seasonal averages. Conditions have been dry across the entire region since Saturday, but a cold front moving slowly through the region will likely bring some showers Thursday and Friday. After the front passes, expect dry weather and rebounding temperatures over the weekend. The water level of Lake Superior is 1 inch lower than the level of one year ago, while Lake Michigan-Huron is 9 inches lower than its level of a year ago. Lakes St. Clair, Erie, and Ontario are 13, 13, and 9 inches, respectively, lower than their levels of a year ago. Over the next month, Lake Superior is forecasted to drop 1 inch from its current level, while Lake Michigan-Huron is expected to fall 2 inches. The water levels of Lakes St. Clair, Erie and Ontario are forecasted to fall 3, 4, and 3 inches, respectively, over the next thirty days. See our Daily Levels web page for more water level information. also expected to be below average throughout the month of September. Lake Erie's outflow through the Niagara River and the outflow of Lake Ontario into the St. Lawrence River are predicted to be below average in September. Lake Superior is near chart datum while Lake Michigan-Huron is below chart datum. Users of the Great Lakes, connecting channels and St. Lawrence River should keep informed of current conditions before undertaking any activities that could be affected by changing water levels. Mariners should utilize navigation charts and refer to current water level readings. ANOKA, Minn. – Sept. 12, 2012 - The award-winning Federal Premium® Ammunition’s Dangerous Game has returned to NBC Sports Network for its eighth season. The show continues the tradition of taking viewers on a thrill ride as hunters use Federal Premium Ammunition to take on some of the world’s deadliest beasts. buffalo, lion, elephant, brown bear, leopard and more. The show has already featured Chris Dorsey traveling to Hungary to take part in a driven boar hunt and another with Dorsey joining David Morris to try and take down a resilient water buffalo. Dangerous Game airs on NBC Sports Network on Wednesday at 3 p.m. EST starting Sept 5, 2012 and running until January 2, 2013. Catch the prime time airings on Sunday nights at 7 p.m. EST starting October 7, 2012. Fall colors are about to burst all over the country and the U.S. Forest Service wants you to get outdoors and enjoy one of nature’s most spectacular seasons in your national forests. From coast to coast, state and local economies are boosted because of the fall season and for many rural communities, fall color tourism is a major source of revenue. Hotels, restaurants and local shops rely on the influx of dollars generated by fall visitors. For example, the New England area receives an estimated $8 billion in local revenues annually due to fall activities. Throughout the Midwest, millions of visitors hit the road to enjoy the sights. In the West, the mountains provide destinations filled with tourists seeking a glimpse of shimmering gold aspens. Weather conditions in all areas impact peak viewing dates, so information provided on the Forest Service website and phone hotline will help visitors best plan their trips. The Forest Service’s Fall Colors 2012 website includes clickable maps that link to forest-by-forest fall color information and to state tourism and fall color websites. Some of our most popular family friendly features include locations of scenic drives and trails, coloring pages for kids, the science behind the season, and links to a tree database. Photographs from visitors nationwide will be added to the site. 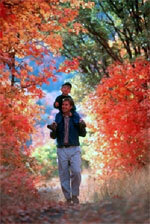 Following tradition, the Forest Service has turned on its Fall Colors Hotline – 1-800-354-4595. The hotline provides audio updates on the best places, dates and routes to take for peak viewing of fall colors on national forests. Citizens living along Lake Ontario and its tributaries are being invited to provide input at a series of six Lake Ontario Basin Communities "Visioning for a Healthy Lake" workshops, September 24-29. New York Sea Grant, the Finger Lakes – Lake Ontario Watershed Protection Alliance (FLLOWPA), and the Niagara County Soil and Water Conservation District are holding the workshops in Lyndonville, Piffard, Webster, Henderson, Sodus, and Oswego to provide information on issues related to Lake Ontario and its priority tributaries, including the Genesee and Oswego Rivers, and to gather input from the public on lake basin conditions and priorities for a healthy lake system. “This important series of workshops calls on citizens of the Lake Ontario watershed to provide input on the current status of the watershed and to identify priorities, barriers and potential strategies for removing those barriers for a healthy coastal ecosystem,” says co-organizer New York Sea Grant Coastal Community Development Specialist Mary Penney. “Participants will help identify the assistance they need for their communities to more fully engage in the protection and responsible use of Lake Ontario,” says co-organizer FLLOWPA Program Coordinator Kristy LaManche. ► September 29, 2012: Oswego, SUNY Oswego Campus Center Room 201, 2-4pm. Workshop discussion will include review of the current Bi-National Lake Ontario Lakewide Management Plan and Lake Ontario Area of Concern Remedial Action Plans. Workshop participants are expected to include local elected officials and planning boards, county agencies and water quality coordinating committees; watershed, lake and outdoor recreation associations; public agency representatives, and private citizens and business owners. Proceedings of the September workshops’ series on the current condition of the Lake Ontario Watershed Basin, stakeholders’ concerns, and the resources and funding sources needed for implementation of priority projects and planning initiatives will be shared with local, State and federal decision-makers, and posted online at www.nyseagrant.org http://www.nyseagrant.org and www.fllowpa.org. The Bi-National Lake Ontario Lake Ontario Lakewide Management Plan (LaMP) includes representatives of the U.S. and Canadian federal governments, New York State, the province of Ontario, and diverse stakeholders organizations. Learn more at http://epa.gov/greatlakes/ontario.html. ► Designated by International Joint Commission to concentrate available resources to clean up the most polluted areas in the Great Lakes. ► U.S. and Canadian entities are cooperating to ensure Remedial Action Plans (RAP) are developed and implemented for each Area of Concern (AOC). ► New York State has six AOCs: Buffalo River, Eighteen Mile Creek, Rochester Embayment, Oswego River/Harbor (delisted in 2006), Niagara River, St. Lawrence River at Massena, NY. The Indiana DNR has a message for Chinook salmon anglers this fall: if it’s missing a fin, please turn it in. Specifically, the message refers to a missing adipose fin, which identifies Chinook salmon that are part of a multi-state research project to study the movement of the species in Lake Michigan and Lake Huron. Anglers this fall on Trail Creek, the Little Calumet system, Salt Creek and the Lake Michigan area near Buffington Harbor and East Chicago should watch for Chinook salmon with a missing adipose fin. Anglers who catch one are asked to bring the fish’s head to the DNR Lake Michigan fisheries research station at 100 W. Water St., Michigan City, during normal business hours. On weekends, anglers can take heads to Lake Michigan Tackle, 1315 Franklin St., or Chief’s Bait Shop, 1114 W. Fourth St. (US 12), both in Michigan City. The adipose fin is a small fin on the top of the fish, near the tail. they have been injected with a small microtag in their snouts. The microtag has a numeric code that tells researchers where the fish was stocked. The DNR asks anglers to deliver only the heads of the fish and not the entire carcass. It is important for anglers to provide date of capture, location of capture, length of the fish, and weight of the fish when possible. Cooperation from anglers will provide valuable assistance to biologists working on the research project. Most of these fish will be 16 to 25 inches long and are from the 2011 year class. This fall will be the first year in which many of those marked Chinook salmon return to streams to spawn. DNR fisheries biologists will scan the fish head to determine if a tag is present. They will then freeze the head and provide it to the U.S. Fish & Wildlife Service for tag extraction. During spring 2012, nearly 100 of the Chinooks were collected during the tournament season. For more information, or to arrange the delivery of a fish head, call Brian Breidert at the DNR Lake Michigan fisheries research station, (219) 874-6824. Registration is open for a DNR program that will teach participants how to hunt whitetail deer in Indiana. Hunt, Fish, Eat takes place at the Monroe County Fairgrounds and is free. The four-session course starts Sept. 20, offering hands-on learning in a safe environment. Hunt, Fish, Eat is an opportunity for people ages 18 and older to improve their self-reliance skills and to learn to harvest a delicious source of fresh, local meat. Curriculum will focus on laws and regulations, firearms and safety, locating a hunting spot, tracking and field dressing your harvest, and handling and preparing your venison for the table. instructors, as well as examine a variety of hunting gear and resources. 1) Sept. 20: 7-9:30 p.m.
4) Oct. 4: 7-9:30 p.m. Participants should register at http://b3.caspio.com/dp.asp?AppKey=311a100067a5c0d3edd7450b85e8. Participants should register for the first session (9/20/2012) only, but plan on attending all four sessions. The Michigan DNR announced on September 15 that a portion of the lower Betsie River and the eastern end of Betsie Bay (also known as Betsie Lake) will be closed to fishing from October 10, 2012, until further notice to protect the fall salmon run in the Betsie River. While the closure will not officially go into effect until October 10 – the earliest date it can be enacted under state law -- the DNR is urging anglers to avoid the area. “Anglers walking around on the exposed sand flats are unintentionally spooking fish, causing the fish to beach themselves and die before they can enter the river to reproduce,” said Justin Vanderlinde, DNR C O for Benzie County, where the river and bay are located. Low water levels in Lake Michigan have caused very low water levels in the east end of Betsie Bay, with sand flats becoming exposed. Because of the extremely low water, Chinook salmon are exposed to high water temperatures and have had a hard time entering the Betsie River to spawn. The order declaring the closure will be signed Monday, Sept. 17, 2012. Under state law, 21 days must elapse after the order is published in a newspaper in the affected county or counties before it can take effect. Publication will take place Wednesday, Sept. 19, 2012, making the order’s effective date Oct. 10, 2012. Despite the closure, much of Betsie Bay remains open to fishing. The deeper western and central portions of Betsie Bay will still be open. This includes the publicly accessible fishing piers at the “Open Space” in Frankfort and at Bayfront Park in Elberta. Salmon fishing opportunities can also be found at other nearby areas, including Platte Bay and the Platte River, Manistee Lake and the Manistee River, and Bear Creek. If Lake Michigan levels remain low, the fall and spring steelhead runs may also be threatened. It is for that reason that the area will remain closed to fishing until further notice. “It may be necessary to keep the area closed in the spring as well to protect the steelhead run,” said Kalish. People can get ready to enjoy the snow this winter by making snowshoes at a two-day workshop at Lake Carlos State Park Oct. 13 and 14, from 9 a.m. to 4 p.m. each day. Workshop presenters will teach participants how to string the laces on prebuilt wooden snowshoe frames and then demonstrate how to walk in the snowshoes. available at the park office ($5 for one day or $25 for 12 months), is required. Class size is limited to 20 people. Registration is required by Sept. 25 to ensure the appropriate quantities and sizes of snowshoe kits are available for the workshop. To register, call the park at 320-852-7200. Candlelight events set for Jan. 19 and Feb. 23. With new snowshoes in hand, workshop participants and other snowshoers and cross-country skiers are invited to attend the Candlelight events taking place at the park on Jan. 19 and Feb. 23, from 6 p.m. to 9 p.m. each night. Weather permitting, participants can ski or snowshoe by the full moon, with candle luminaries set along the trails to guide their path. Then they can warm up by the wood stove and enjoy refreshments provided in the warming shelter. Asian carp aren't waiting around for the U.S. Army Corps of Engineers to study and ponder. Congress and the White House, which have taken charge of the problem, should be prodding the Corps to move faster. A rural Ontario couple is heading to court to halt development of a large wind farm near the shores of Lake Huron – at least until Health Canada completes a new two-year study on the potential risks of living next to industrial wind turbines. More Asian carp DNA has turned up in Lake Erie, accelerating the urgent need for Congress and the Obama administration to push the U.S. Army Corps of Engineers to move faster on a long-term solution to the threat posed by the voracious fish. The summer of 2012 may go into the record books for several reasons (heat, drought, lack of cherries), but Michiganders should also take note of potential pivot points in the health of the Great Lakes. The exemplar this year is Lake Michigan, where signs of stress are building. In 2009, researchers used environmental DNA, or eDNA, testing to detect traces of Asian carp closer to Lake Michigan than previously believed. Similar eDNA results have now turned up in Lake Erie for the first time. The reaction, however, has been far different this time: no closures and no lawsuits. Earlier this spring, the U.S. Army Corps of Engineers was ordered to speed up a five-year study of options to block invasive Asian carp from entering the Great Lakes. Many biologists say the best solution would be complete separation of the Great Lakes from the Mississippi River watershed.